Hanging planters. So retro. So all over the internet. But, I think they are cool. And I think they seem like easy, cheap decor, which is my favorite. So, I finally made my own! I actually had a tough time interpreting directions from a few different sites to make this, so I thought I would share how I did it and what I learned. 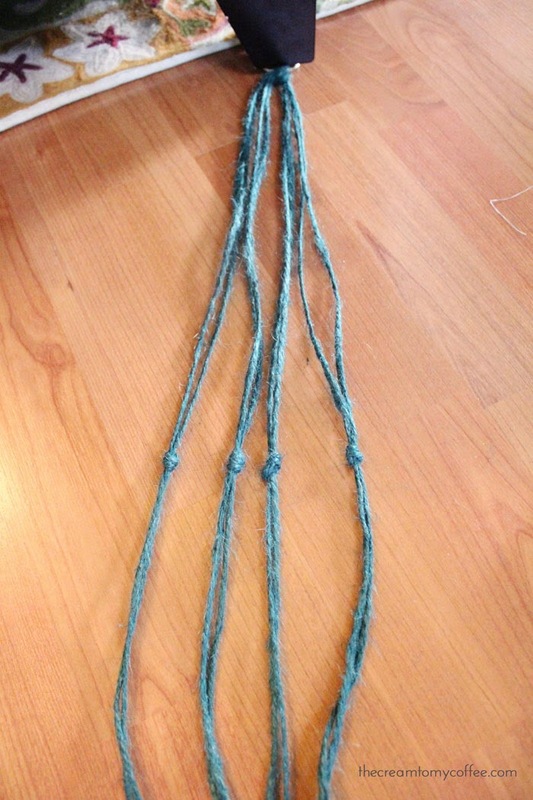 Step 1: cut four pieces of string the same length. Mine were about 6 feet long, but you may need to cut them longer if your pots are bigger. 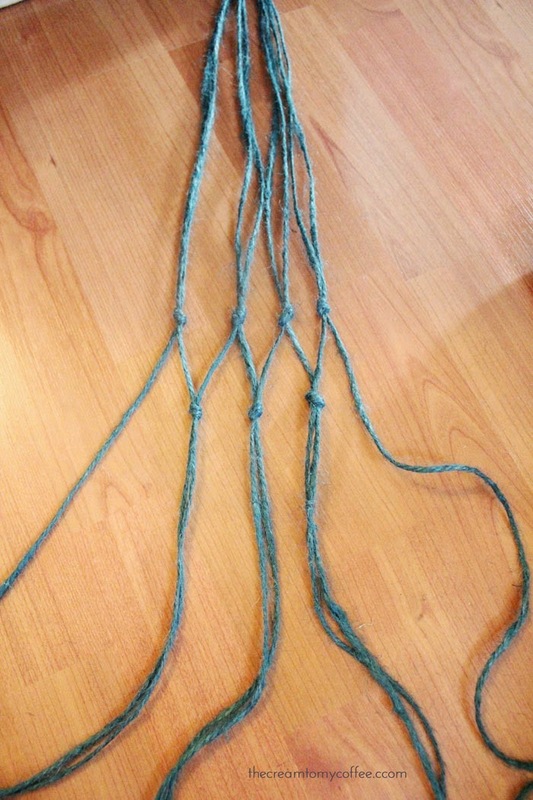 It is better to start with string that is too long, since you can always trim it up later. 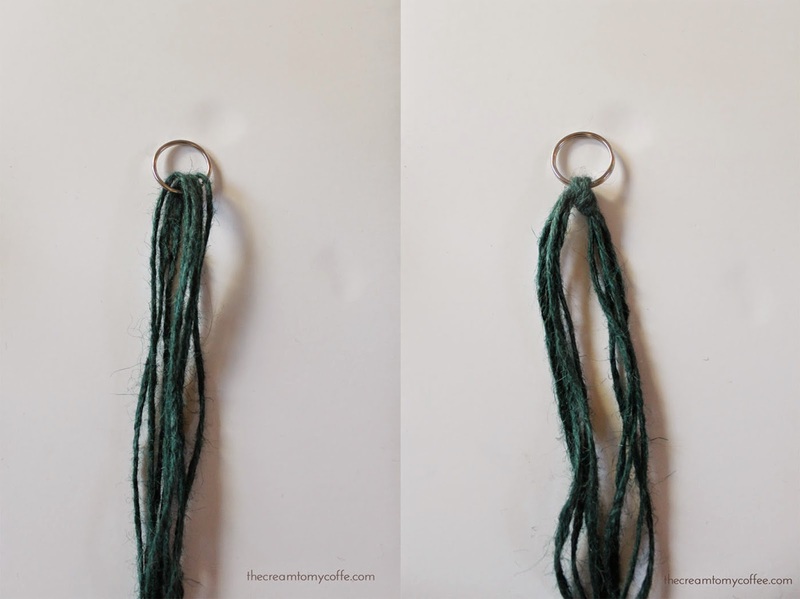 Step 2: Loop the strings through the keyring and make sure the ends are even. Then, tie a knot right under the ring so that you have four pieces of string on each side. 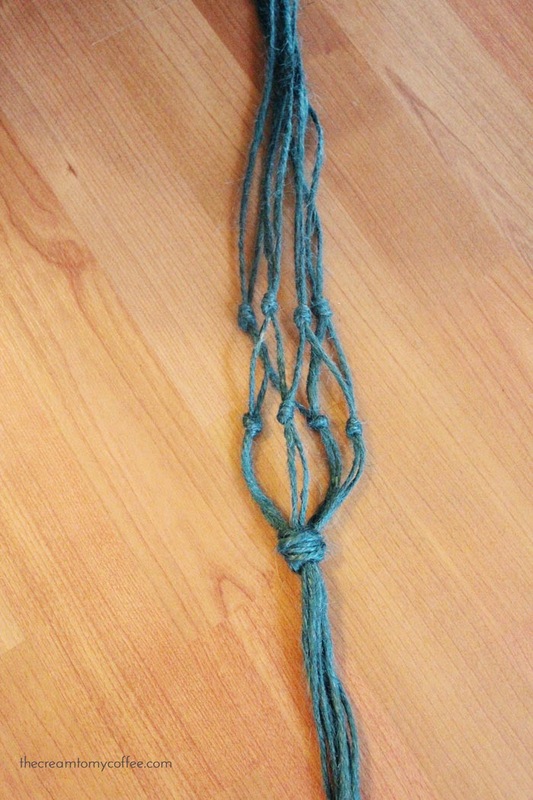 Step 3: Loop the keyring under something sturdy so you can pull on it while making knots (I used a chair leg). 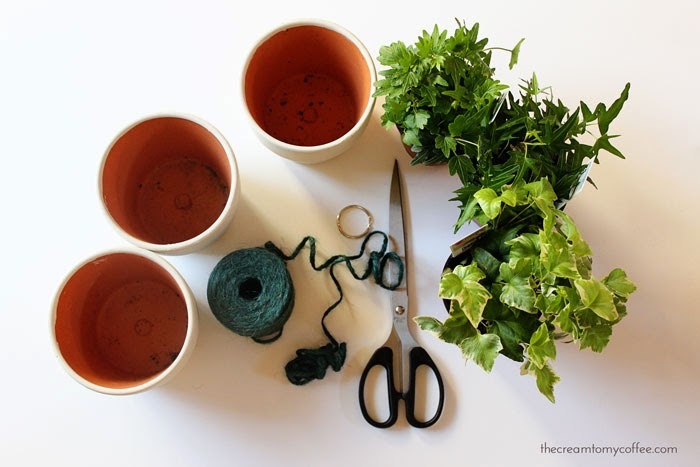 Guesstimate where you want the first pot to be and then create 4 knots by tying the two pieces of string closest to each other together. 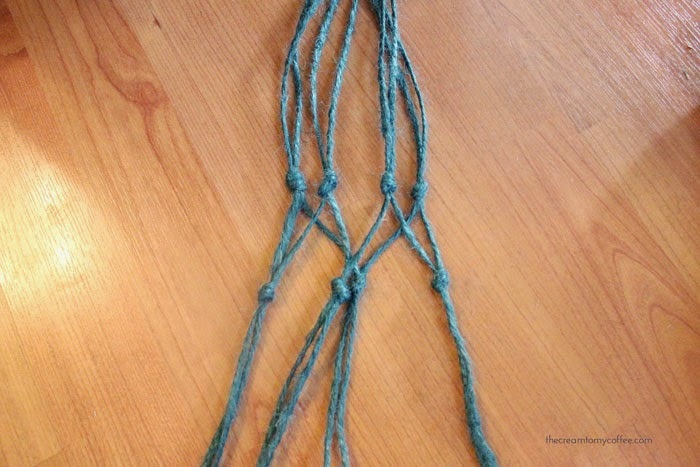 Step 4: About 2 inches down from your first set of knots (or longer, if your pot is bigger), create a weave by tying the cross pieces together (as show above). Step 5: Tie the outside pieces together to form a circle. You will want to take a minute to place your pot in the opening to see how it sits. You can adjust the knots as needed. Step 6: Tie all 8 strings together where you want your pot to rest. Repeat the whole process 2 more times! Cute! 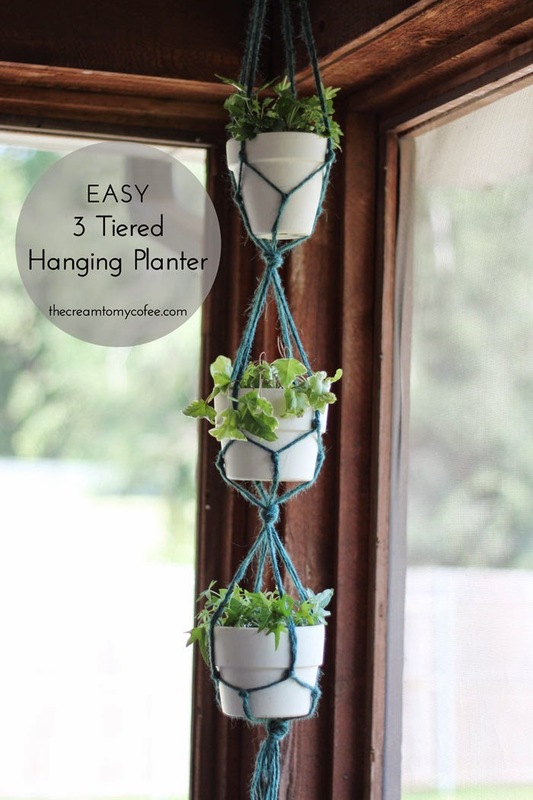 I totally remember having these types of hanging planters in the house growing up! this is such a cute idea! wish i had somewhere to hang it, i would totally do it. and I'm thinking this just might need to happen! I have a hook on my front porch and this would be perfect! What a great DIY! This is perfect for all the plants I'll have to bring in this winter! This is adorable! 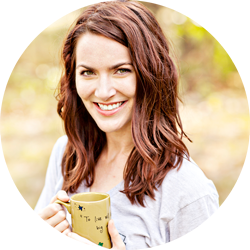 I am totally pinning this for next spring! This looks so great! You've made it look easy to do too, bonus! How cute! I just saw this done on a DIY show, so the trend must be coming back!